This textbook treats Celestial Mechanics as well as Stellar Dynamics from the common point of view of orbit theory making use of the concepts and techniques from modern geometric mechanics. It starts with elementary Newtonian Mechanics and ends with the dynamics of chaotic motions. The book is meant for students in astronomy and physics alike. Prerequisite is a physicist's knowledge of calculus and differential geometry. Volume 1 begins with classical mechanics and a thorough treatment of the 2-body problem, including regularization, followed by an introduction to the N-body problem with particular attention given to the virial theorem. Then the authors discuss all important non-perturbative aspects of the 3-body problem. A final chapter deals with integrability of Hamilton-Jacobi systems. Half a century ago, S. Chandrasekhar wrote these words in the preface to his l celebrated and successful book: In this monograph an attempt has been made to present the theory of stellar dy namics as a branch of classical dynamics - a discipline in the same general category as celestial mechanics. [ ... J Indeed, several of the problems of modern stellar dy namical theory are so severely classical that it is difficult to believe that they are not already discussed, for example, in Jacobi's Vorlesungen. Since then, stellar dynamics has developed in several directions and at var ious levels, basically three viewpoints remaining from which to look at the problems encountered in the interpretation of the phenomenology. Roughly speaking, we can say that a stellar system (cluster, galaxy, etc.) can be con sidered from the point of view of celestial mechanics (the N-body problem with N " 1), fluid mechanics (the system is represented by a material con tinuum), or statistical mechanics (one defines a distribution function for the positions and the states of motion of the components of the system). - The Theory of Orbits from Epicycles to "Chaos".- 1. Dynamics and Dynamical Systems - Quod Satis.- 2. The Two-Body Problem.- 3. The N-Body Problem.- 4. The Three-Body Problem.- 5. 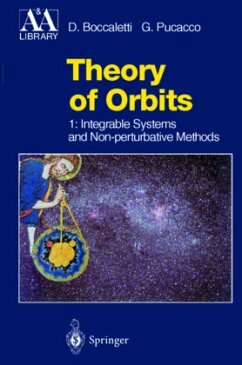 Orbits in Given Potentials.- Mathematical Appendix.- A.1 Spherical Trigonometry.- A.2 Curvilinear Coordinate Systems.- A.3 Riemannian Geometry.- Bibliographical Notes.- Name Index.